As you probably noticed, I'm experimenting with the coupon code features on Etsy and Ravelry. Virtual shopkeeping is interesting. I have a lot to learn about turning my personal passion into a "proper" career. In other news, my pattern proposal for Jane Austen Knits, an Interweave "bookazine" to be published in November, was accepted! I'm anxiously awaiting my contract and yarn, so I can get knitting on the sample garment. This is exciting for me on a number of levels. First, it's Jane Austen. And my proposal is based upon my favorite of her novels, Persuasion . No more on that, or I'll give it away! Second, of course, is that this is an Interweave publication, and I am beyond happy to be working with Amy Moore and the Interweave staff. 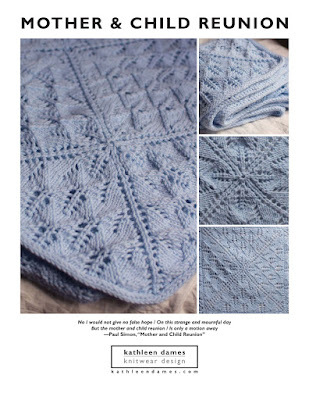 I think very highly of the Interweave needlework publications (Knits , KnitScene , Crochet , PieceWork , Spin-off ). As far as I'm concerned, this is the "big leagues" of print publications. And I just finished my re-knit for KnitPicks in their Comfy yarn, which was a pleasure to knit. Can't wait to show it to you, but we must find a day with some sunlight for pictures. Isobel will be my model, and we all know how she loves the camera. The weather forecast for tomorrow looks promising. I'm working on some other things "behind the scenes", so I'm afraid there are no pictures in this post. Exciting to work on but boring blog fodder. I'm sorry! I'd like to do a little knitting soon that's just for fun. Continuing the Mother's Day love, use the code "mother20" on Ravelry to receive 20% off all patterns. Now through 8 May, so you can even wait until the last minute! Through 30 April, 50% of all purchase prices in my Etsy and Ravelry shops will be donated to the Red Cross to aid Japan in their time of need, as well as everyone else who ever needs help from the Red Cross. Mother's Day is coming up, and what better occasion to offer a coupon in my Etsy shop than that? Now through May 8th use the code "mother20" (no quotes) and receive 20% off any purchase, including my handknitted Matryoshka doll sets. As always, shipping is free.